2 How do termite baiting systems work? 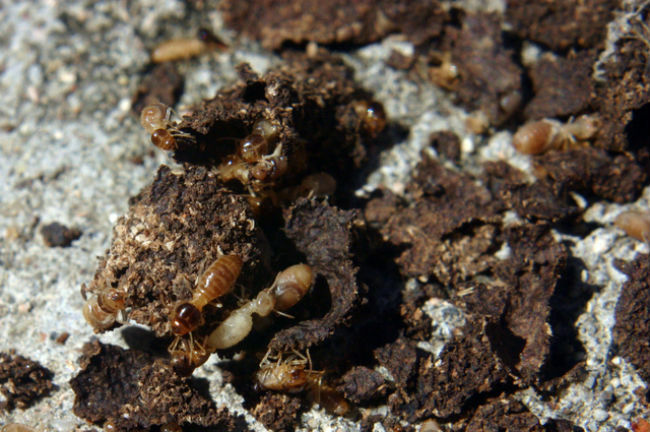 Termite baiting systems are the newest innovation in control of all economically important subterranean termite species, including Formosan, Coptotermes, Reticulitermes, and Heterotermes spp., in the continental United States and Hawaii. They work successfully in varying climate, soil and geographic conditions. Termite baiting systems control undeground wood pests in and around a structure with the help of carefully placed stations that contain poison. This lethal toxin is spread via the entire colony by the foraging termites. Baits help to limit the amount of insecticides greatly. Use of anti-termite stations is a more eco-friendly method of control than traditional termicide soil barriers. Baits are well contained and decrease chances of exposure to the chemical, though, they should be applied only as directed in the product label and with utmost care. Toxicants in various bait stations are slow acting in order to enhance transmission of the toxin to other colony-mates: soldiers, reproductive alates, Queens and kings, and to avoid the build up of the piles with sick and dead termites close to the baits. It will deter other termite-mates from this area. Termitrol and Termirid 613 contain boric acid. Borates kill termites via destroying their digestive system. It is the least toxic, “green” termite bait system against subterraneans. Firstline termite bait system and Terminate include sulfluramid. It is a stomach poison, which interferes with termite metabolic processes and causes the death of all types of subterranean termites, including reproductives, from starvation. HexPro, Shatter and Sentricon termite baiting systems include an active ingredient of hexaflumuron. Hexaflumuron has demonstrated a ten-year in-field success in controlling and eliminating termites. It is a termites’ growth regulator, which stops their vital molting process. As a result, they are unable to grow anymore. Exterra termite baiting system labeled as Labirinth termite bait) and Outpost termite bait response contain diflubenzuron. Diflubenzuron and noviflumuron (recent replacement in some baits) are chitin synthesis inhibitors that disrupt the termites’ normal molting process. They cause foraging termite workers to die in the process of shedding their skin. Other colony-mates starve and die as well. Once subterranean termite baiting systems are positioned and installed, as a rule, it takes from a few weeks to a few months for termites to enter the monitoring and baiting termite stations. It depends on time of year, geographical and climate conditions, termites’ activity, natural behavior and their species. When the termites enter the bait cartridges, they start feeding on poison from wood bait and the process of termite control begins. Colonies are declining during four weeks after ingesting toxicant. It is important to remember that the time and effort needed to achieve control can alter due to varying behavior of different species of termites. Termite baiting systems are designed and intended for application in your yard, garden or around your house. Stations are installed below the ground and placed close to the active termite infestations, their shelter-tubes or feeding zones. They can also be positioned above ground in the detected areas of termite infestations and their activity, as a rule, in the direct path of active termite tunnels after the shelter-tubes were broken. Target areas for installation of bait stations are fences, buildings, decking, utility poles, landscape plantings and trees, and other sites, products and structures that are damaged (or are likely to be damaged) by feeding and foraging activity of subterranean termite colony. If the nest of subterranean colony is right beneath the house and termites have found a food source indoors, baiting stations work effectively as well. Natural behavior of termites gives benefits as they are constantly looking for more food elsewhere beyond the house. Bait stations are an easy target for foraging termites in the soil. Homeowners are recommended not to reuse termite bait stations as the foraging workers, who feed on the wood in the bait, secrete a colony specific pheromone, which may deter other termites from feeding on this station.